Manchester Show 2011: Elipson mini M speakers join up with Planet sub | What Hi-Fi? 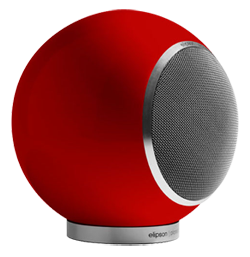 Elipson has given us a sneak preview of its new, smaller Planet M speaker, which combines with the Planet subwoofer to make up a 2.1 system. The Planet M looks similar to the existing Planet L, but is substantially smaller. It's a two-way, bass reflex speaker with a 10cm treated paper cone and 20mm silk dome tweeter. Available in gloss black, white or red, the Planet M was designed by Jean-Yves Le Porcher. A floorstand, wall bracket and ceiling bracket are optional extras. Elipson says the Planet M is voiced to work alongside the Planet sub (below). It has a 20cm driver powered by a 200W amplifier and is available in the same three colours as the Planet M.
Both products should be available in the UK in the next month or so, with prices to be confirmed soon.